If saving time and money is your gooooaaaal, TriMet’s service to Providence Park is your riiiiide! Take advantage of convenient bus and MAX service to get fans to and from Timbers and Thorns matches this season. The Timbers regular season kicks off on Friday, March 3 at Providence Park against Minnesota United FC. The Thorns host a three-game, preseason tournament March 27-April 3, with their regular season opener against Orlando Pride April 17. 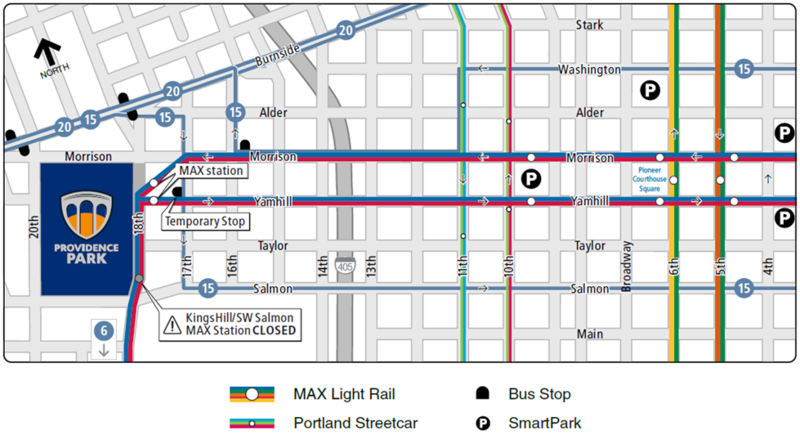 Our MAX Blue and Red Line trains drop you and pick you up across the street from Providence Park. Two regular service bus lines, Line 15-Belmont/NW 23rd and Line 20-Burnside/Stark, serve the stadium. Extra MAX trains will service Providence Park before and after Timbers games. Extra MAX service will be added as necessary for Thorns games. After the match, Line 15 buses headed toward Gateway Transit Center will pick up riders at a temporary stop on SW 17th & Yamhill. Due to low usage, the express buses that had provided service before and after Timbers matches between downtown and Providence Park will no longer run. The price of a 2 ½ hour ticket or a Day Pass will be much cheaper than metered parking with event parking rates in effect nearby. Plan your trip there with TriMet’s online trip planner. Fares are required throughout the TriMet system on both buses and trains. Buying your fare is easy with the free TriMet Tickets mobile app. It’s quick and simple to purchase tickets and passes instantly on your phone – anywhere, anytime. Just download the free app, register your debit/credit card in our secure system and you’re ready to buy, activate and go. Learn more at trimet.org/app. TriMet’s online trip planner at trimet.org makes it easy to plan a trip, with information on travel and walk times, transfers and cost.